The precious metals—gold, silver, and platinum—have historically been valued for their beauty and rarity. Ancient people considered gold and silver to be of noble birth compared to the more abundant metals. Chemists have retained the term noble to indicate the resistance these metals have to corrosion and their natural reluctance to combine with other elements. The course of recorded human history shows twists and turns influenced to a large degree by precious metals. It was Greek silver that gave Athens its Golden Age, Spanish gold and silver that powered the Roman Empire's expansion, and the desire for gold that motivated Columbus to sail west across the Atlantic. The Spanish exploration of Latin America was also driven in large part by the search for gold. Small amounts of gold found in North Carolina, Georgia, and Alabama played a role in the 1838 decision to remove the Cherokee nation to Oklahoma. The California gold rush of 1849 made California a state the following year, and California gold fueled northern industry and backed up Union currency, two major factors in the outcome of the American Civil War (1861–65). Since ancient times, gold has been associated with the Sun. Its name is believed to be derived from a Sanskrit word meaning "to shine," and its chemical symbol (Au) comes from aurum, Latin for "glowing dawn." Pure gold has an exceedingly attractive, deep yellow color. It is soft enough to scratch with a fingernail, and it is the most malleable of metals. A block of gold about the size of a sugar cube can be beaten into a translucent film some 27 feet (8 meters) on a side. Gold's purity is expressed either as fineness (parts per 1,000) or in karats (parts per 24). An alloy (mixture of two or more metals with properties different from those of the metals of which it is made) containing 50 percent gold is 500 fine or 12 karat. Gold resists corrosion by air and most chemicals, but it can be dissolved in a mixture of nitric and hydrochloric acids, a solution called aqua regia because it dissolves the "king of metals." Gold is so rare that one ton of average rock contains only about eight pennies worth of gold. Gold ore (an ore is a mineral compound that is mined for one of the elements it contains, usually a metal element) occurs where geologic processes have concentrated gold to at least 250 times the value found in average rock. At that concentration, there is still one million times more rock than gold and the gold is rarely seen. Ore with visible gold is incredibly valuable. Gold most commonly occurs as a pure metal called native gold or as a natural alloy with silver called electrum. Gold is found in a wide variety of geologic settings, but placer gold and gold veins are the most economically important. Catalyst: A compound that speeds up the rate of a chemical reaction without undergoing any change in its own composition. Compound: A substance consisting of two or more chemical elements in specific proportions. Hydrothermal fluid: Underground hot water-rich fluid capable of transporting metals in solution. Placer: A gravel or sand deposit left by a river containing a concentration of heavy mineral grains such as gold or platinum. Placer gold is derived from gold-bearing rock from which the metal has been freed by weathering. Gravity and running water then combine to separate the dense grains of gold from the much lighter rock fragments. Rich concentrations of gold can develop above deeply weathered gold veins as the lighter rock is washed away. Gold washed into mountain streams forms placer deposits where the stream slows enough to deposit the gold. Placer gold is also found in gravel bars where it is deposited along with much larger rocky fragments. The discovery of placer gold set off the California gold rush of 1849 and the rush to the Klondike in 1897. The largest river placers known are in Siberia, Russia. Gold-rich sands there are removed with jets of water, a process known as hydraulic mining. Vein gold is deposited by hot subterranean water known as a hydrothermal fluid. Hydrothermal fluids circulate through rock to leach (dissolve out) small amounts of gold from large volumes of rock and then deposit it in fractures to form veins. Major United States gold vein deposits have been discovered at Lead in the Black Hills of South Dakota and at Cripple Creek on the slopes of Pikes Peak, Colorado. Important vein deposits are also found in Canada and Australia. 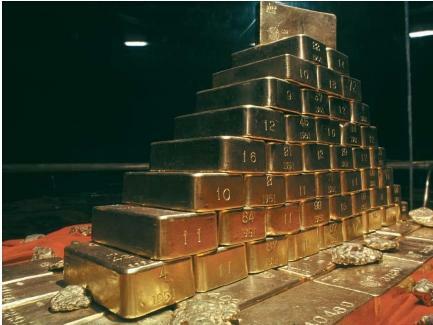 that 70 percent of all gold recovered has been mined since the beginning of the twentieth century. Each year, nearly 2,000 tons (1,800 metric tons) are added to the total. Nevada currently leads the United States in gold production, while the Republic of South Africa is the world's leading gold-producing nation. Gold has traditionally been used for coins, bullion, jewelry, and other decorative items. Because of its chemical properties, gold is nonallergenic and remains tarnish-free indefinitely. For much the same reasons, gold has long been used in dentistry. Modern industry employs increasing quantities of gold, mostly for use as electrical contacts in microcircuits. Silver is a brilliant white metal and the best metal in terms of thermal (heat) and electrical conductivity. Its chemical symbol, Ag, is derived from its Latin name, argentum, meaning "white and shining." Silver is not nearly as precious, dense, or noble as gold or platinum. The ease with which old silverware tarnishes is an example of its chemical reactivity. Although native silver is found in nature, it most commonly occurs in compounds with other elements, especially sulfur. Hydrothermal veins constitute the most important source of silver. The Comstock Lode, located 15 miles (24 kilometers) southeast of Reno, Nevada, is a well-known example. Hydrothermal silver veins are formed in the same manner as gold veins, and the two metals commonly occur together. Silver, however, being more reactive than gold, can be leached from surface rocks and carried downward in solution. This process can concentrate silver into exceedingly rich deposits deep underground. Mexico has traditionally been the world's leading silver producing country, but the United States, Canada, and Peru each contribute significant amounts. Vast quantities of silver are used in jewelry, silverware, and coins, but even larger amounts are used in products of the photographic and electronics industries. Platinum, like silver, is a beautiful silver-white metal. Its chemical symbol is Pt, and its name comes from the Spanish world for silver ( plata ), with which it was originally confused. Like gold, it can be found in pure metallic chunks in stream placers. Platinum commonly occurs with five similar metals known as the platinum group metals. The group includes osmium, iridium, rhodium, palladium, and ruthenium. All are rare, expensive, and classified chemically as noble metals. Platinum is found as native metal, natural alloys, and as compounds with sulfur and arsenic. Platinum ore deposits are rare and highly scattered. Nearly half the world's historic production of platinum comes from the Republic of South Africa. Platinum is used mostly in catalytic converters for pollution control on automobiles. Low-voltage electrical contacts form the second most common use for platinum, followed closely by dental and medical applications, including dental crowns and a variety of pins and plates used internally to secure human bones. Platinum is also used as a catalyst in the manufacture of explosives, fertilizer, gasoline, insecticides, paint, plastic, and pharmaceuticals. I thanks for such important information you have presented to me. I also want to know why those metals are least reactive/placed at the bottom of the series? i have something i need to ask though..why is silver not reactive?